If you want to upgrade your showerhead, what style should you choose? The best handheld shower head gives you a lot more flexibility compared to a standard wall-mount model. Take a look at a few of our top picks for the best handheld showerhead. When it comes to choosing the best handheld showerheads, we looked at a few different features. One of those features was the hose that connects the shower head to the wall. For the most part, all of the models we looked at had a hose that was between 5 and 6 feet in length. Only one model, the Aqua Elegante, didn’t come with a hose at all. The majority of the shower heads we looked at were made of plastic, which helps to keep the price down but can also mean that their useful life is shorter compared to a metal shower head. Multiple spray settings is a key feature of most handheld showerheads. Interestingly enough, the priciest model in our roundup, from Moen, had the fewest spray settings (only 4). Our top pick shower head, from Delta, had seven. Finally, one feature that seemed common on most of the shower heads was self-cleaning spray holes or nozzles. The nozzles are often made from rubber or silicone, which makes it easy to wipe away hard water build up. The Delta handheld showerhead features a chrome finish and seven spray settings. Depending on the mood you’re in or the type of shower experience you want, you can choose from massaging spray, full body spray, shampoo rinsing spray or drenching spray. You can also combine two sprays into one, such as drenching spray with massaging spray or massaging spray with full body spray. A particularly neat feature of the Delta shower head is the touch-clean spray holes. They are made of soft rubber and are designed to let you remove hard water build-up easily just by rubbing the shower head. If you shave while in the shower, you’ll appreciate the pause feature, which lets you switch the water flow down to just a small trickle. With the pause feature, you don’t have to turn the water completely off. The Delta handheld showerhead comes in two water flow options, either 2.0 GPM or 2.5 GPM. People who’ve used the Delta shower head have praised it for being affordable and sturdy. The one complaint people seem to have about it is that the hose is a bit stiff and unwieldy. Easy to clean spray holes. The hose is 6 feet long. The hose can be stiff and difficult to maneuver. Chrome finish might not match all bathroom fixtures. The angle of the shower head (when attached to the wall) is high. The Moen handheld Showerhead has a brushed nickel finish and four spray settings, including an “invigorating” spray and a massage spray. The nearly 6-foot hose is made from a flexible metal, so it’s easy to move it around the shower and to reach otherwise hard-to-reach spots. For people who live in states that restrict water flow, you’ll be happy to learn that the Moen showerhead uses at most 2.0 GPM. 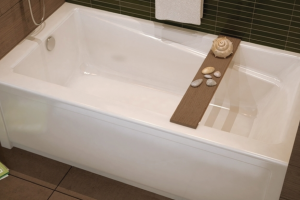 Another great feature of the showerhead is the 30-inch slide bar, which lets you easily adjust the height of the shower attachment up or down, depending on the height of the person using it. One annoying thing about the Moen showerhead is that it doesn’t come with the attachments needed to connect the fixture to the wall of your shower. You need to purchase the “ell” separately. People who have used the Moen showerhead are pretty happy with it, with a few caveats. One is that the product has an excellent warranty service, but they also had to make use of the warranty. 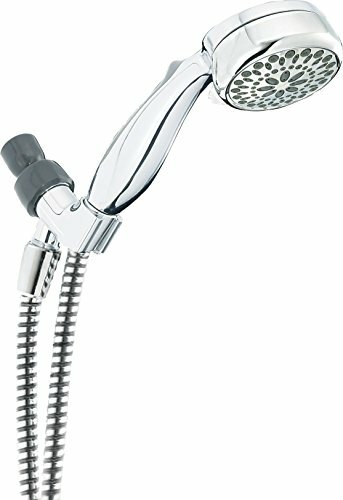 Another common complaint people had about the showerhead was for the price, they expected a lot more. 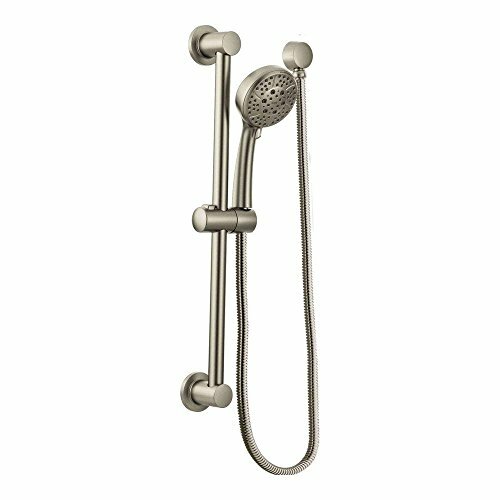 The Moen showerhead costs well over $250, but several people noted that it felt cheap and flimsy. Has a slide bar for easy height adjustment. Uses no more than 2.0 GPM. Has a flexible, 6-foot hose. Doesn’t come with “ell” attachment. 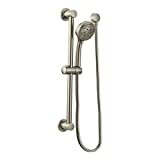 If you like to purchase everything separately, the Aqua Elegante shower head might be the right one for you. It’s just the shower head — no attachments or hose are included. That might seem like a pain, but it can be a plus. 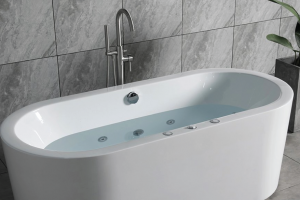 For one thing, it means that you can choose the length of hose and the material of the tubing that goes along with the shower head. It also means that you can efficiently use your existing wall connectors. The Aqua Elegante shower head is made from ABS plastic, which can also be a good thing and a bad thing. The plastic is styled to look like oiled bronze but doesn’t have the maintenance requirements. 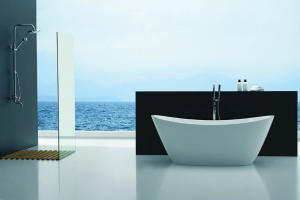 If you like a lot of options when it comes to water flow, the shower head delivers. It has six spray settings, including “power blast,” “gentle rain,” and massage. You can also combine multiple spray settings at once. 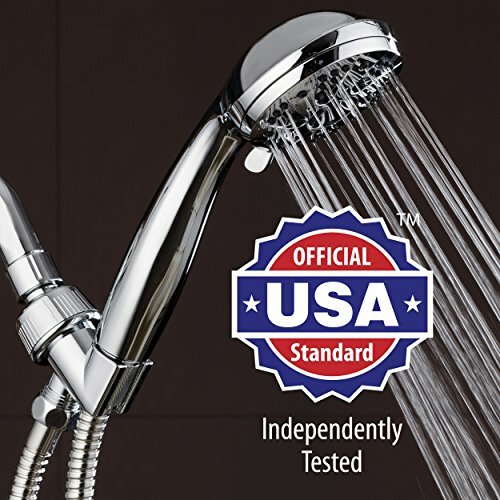 Several people who have used the Aqua Elegante shower head have noted that the shower head has somehow been able to solve their low water pressure problems. They’ve found that the water pressure had increased after they installed the shower head. Has a removable flow restrictor. Has easy-to-clean silicone spray holes. Doesn’t include hose or connector. Like the Aqua Elegante, the Briout handheld shower head is also made from ABS plastic and comes with a removable flow restrictor. With the flow restrictor installed, the shower head releases up to 2.5 GPM. 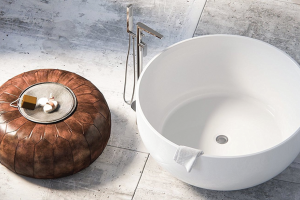 The shower head claims to create a luxury spa experience at home. Does it do that? We’re not so sure, but it does have five different spray functions and what it claims to be self-cleaning nozzles. The shower head comes with a 5-foot long hose, an adjustable wall bracket and even Teflon tape to help with installation. 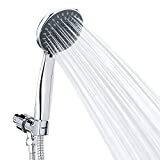 Those who’ve used the shower head have been pretty happy with it, with several noting that it provides great water pressure and that it was easy to install. Of course, too much water pressure can be a bad thing — one person noted that the shower head felt like a power washer. Has a 5-foot flexible hose. Made from plastic, which can crack or spring a leak readily. The water flow of 2.5 GPM might be too high for states (California and Colorado) with more restrictive laws. One of the more unusual things about the AquaDance handheld showerhead is that it claims to come with a “stunning gift box designed in the USA.” We’re not sure how many people give shower heads as presents, but if that describes you, this might be the one to pick. The shower head includes tape, a hose, washers and a bracket for easy installation (there’s no need to buy anything separately). It has six spray settings, including a massage spray and a pause feature. One thing people who’ve used the AquaDance shower head have noted is that you need to remove the included flow restrictor to get the most out of the product. A common complaint about the shower head has to do with the hose. Several people noted that their hose broke or split after a few months of use. Easy to install, comes with everything you need. Wall-mount bracket is easy to adjust for people of different heights. The hose can be flimsy. 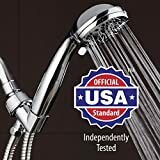 What’s the difference between a handheld showerhead and other models? The major difference is in how the shower heads attach to the wall. A fixed shower head, sometimes called a wall-mount shower head, is permanently attached to the wall. If you want to move it, you have to unscrew it from the wall entirely. In contrast, a handheld showerhead can connect to the wall. But it’s attached to a hose that lets you pick it up and move it around, without disconnecting it from the water supply. Handheld shower heads can be ideal if you have small children or pets, as you can hold the shower head in your hand and guide the water where you want it to go. They are also ideal for people who have limited mobility. Additionally, handheld showerheads can make it easier to rinse out your tub or shower when you’re cleaning it. Instead of having to pour water from a bucket into a corner of the shower to rinse away the cleaner, you can direct the shower head towards otherwise hard-to-reach areas. It’s also easier to adjust the height on the best handheld showerhead compared to shower heads that are attached to the wall. That means there’s no need to fuss with the shower head if someone in your house is 6-feet-tall and someone else is barely 5-feet-tall. When you’re picking out the best handheld showerhead for your bathroom, there are a few features to consider and a few things to keep in mind. Here’s what to pay attention to. Spray options. Some shower heads let you adjust the spray with the turn of a nozzle, giving you options such as full spray, massage spray, pause or drenching rain. Finish. Do you want a plastic showerhead, one that’s chrome, brushed nickel, or brass? Shower heads often come in a range of different finishes so you can find one that matches the fixtures in the rest of your bathroom. Water usage. Today’s showerheads have to have a flow rate of under 2.5 gallons per minute and some states have even lower requirements (1.8 GPM in California, for example). Water pressure. Often, shower heads make up for water use restrictions by using more pressure or aerating the flow of water. 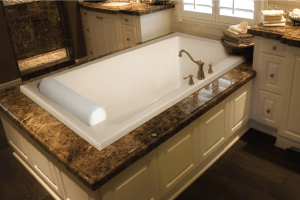 Some models are also designed specifically for homes with low water pressure. Hose length. This might not seem like much of an issue, but there can be a big difference in flexibility and ease of use between a 3-foot hose and a 6-foot hose. The number of shower heads. You might come across a handheld showerhead that has two shower heads, while many models have just one. Although the job of your shower head is to clean you, you might find that from time to time, you need to clean it. Luckily, caring for the best handheld shower head isn’t too complicated. The easiest way to clean a shower head is to fill a zip-top sandwich bag with distilled white vinegar. Slip the bag over the showerhead, so that it’s submerged in the vinegar. Secure the bag to the shower head somehow (such as with a rubber or elastic band), then let it sit in the vinegar for a few hours. Remove the bag, pour out the vinegar, and gently wipe the surface of the shower head clean to remove any lingering build-up or debris. 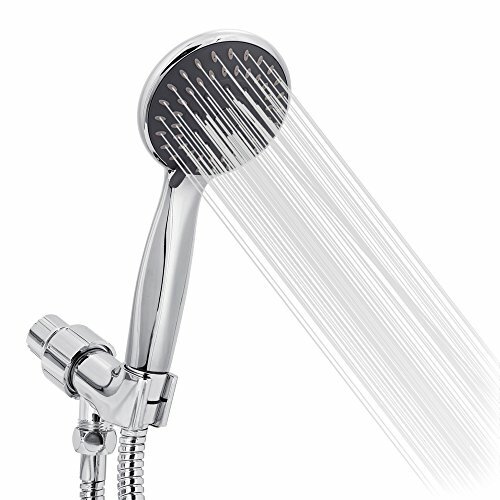 Hands down, the Delta 75701 7-Spray Touch Clean Hand Held Shower Head with Hose emerges as the winner of our roundup. It’s got the most spray settings, had a budget-friendly price tag and had more water flow settings than other models. It might be made out of plastic, but you’re going to be hard-pressed to find a handheld showerhead that isn’t these days.